This is a world class skatepark designed for multiple ages and levels of kids with skateboards, BMX bikes, or scooters. Some say it’s the best skate park in the country, but you can let your kids decide! The designers have thought about younger kids too by including a small playground with toilets next to the equipment (including a change table). 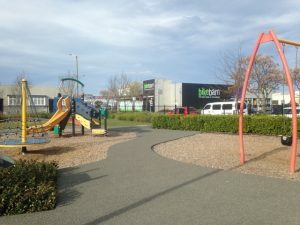 There’s plenty of seating and grass for picnics although no shade at the moment (the park was built in 2013 so the trees will take time to provide shade). A nice touch is the kiosk near the skatepark home to a park supervisor but also lending out skateboards, scooters and helmets if you don’t have your own. They also have sunscreen for you to use. Address: Corner of St Aubyn Street and King Street with parking on both streets. Open: daily 9am – 7pm.